Authorized Manufacturers Representatives for over 350 US Manufacturers. 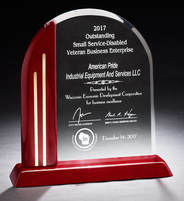 American Pride Industrial was honored to receive the 2017 Wisconsin Governor’s Award for Outstanding Service-Disabled. Copyright © 2017-2019 All rights reserved American Pride Industrial.